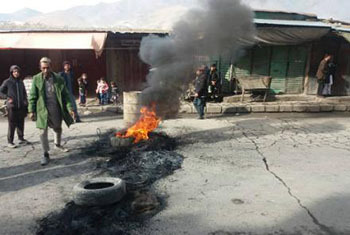 Some residents of Parwan province, in the center of Afghanistan, closed the Kabul-Mazar highway to traffic early on Friday morning to protest against a military operation carried out by Afghan and foreign forces in Jabal Saraj district in the province. The residents claimed that three civilians have lost their lives in the military operation. 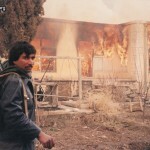 The military operation was carried out in Bain-e-Bagh Ha area in the district, the residents said. Meanwhile, provincial police chief Mohammad Mahfooz Walizada told TOLOnews that the military operation was carried out by Afghan Special Force and foreign troops in Bain-e-Bagh Ha area “without coordination with the police headquarters”. He said three civilians have lost their lives in the military operation. Walizada said the military operation was carried out to target a group leader of illegal armed men named Wazir, but according to him, the forces targeted another area instead of their main target which inflicted casualties to civilians. Photos shared on social media from the province show a destroyed house which residents claim has been targeted by the Afghan and foreign forces during the operation. Security officials in Kabul have not commented on the report so far. A Resolute Support spokesman, Debra Richardson, said in a statement that neither Resolute Support nor US forces have conducted operations in Parwan over the past three days. Afghan war costs American taxpayers 4 million USD per hour  study.